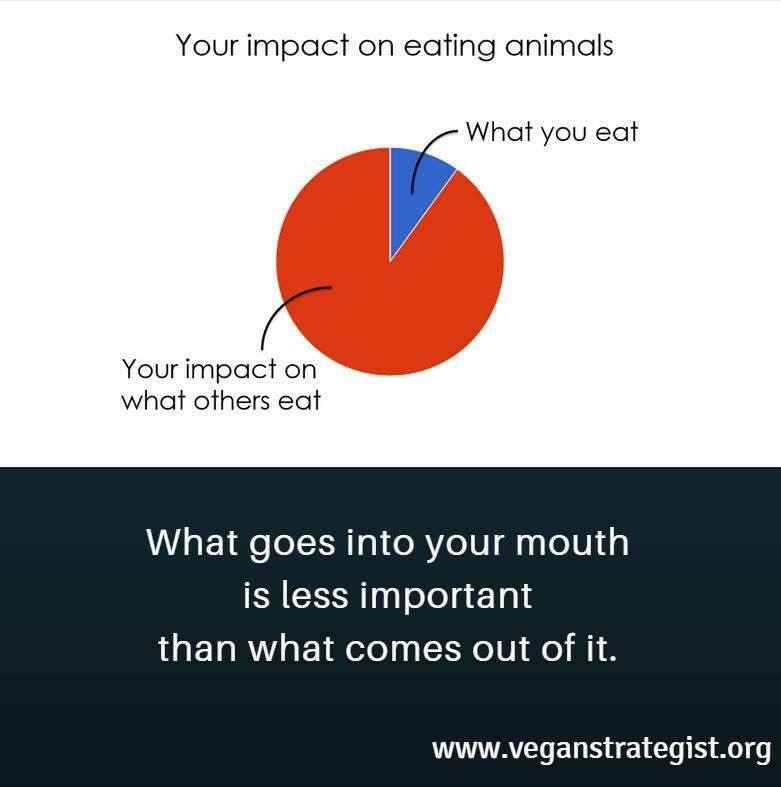 As I and others have noted many times, what we do with our example, our advocacy, and our donations is far more important than what we choose to eat. Yet few of us worry as much about the impact of our example as we do about the purity of our ingredient lists. The first mistake many of us made is that we have poisoned the brand. 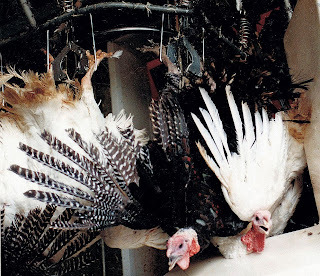 Of course, knowing what happens to animals every day, we are totally and completely justified in being angry. Rage, fury, and even hatred – these emotions are entirely understandable. But turning this fury onto people is not the way to have anyone open their heart or mind to the idea of considering their culpability and contemplating change. This is dead-simple obvious to anyone who has studied psychology or surveyed vegetarians. (“How many of you stopped eating meat because someone yelled 'Go VEGAN, you MURDERER!'? 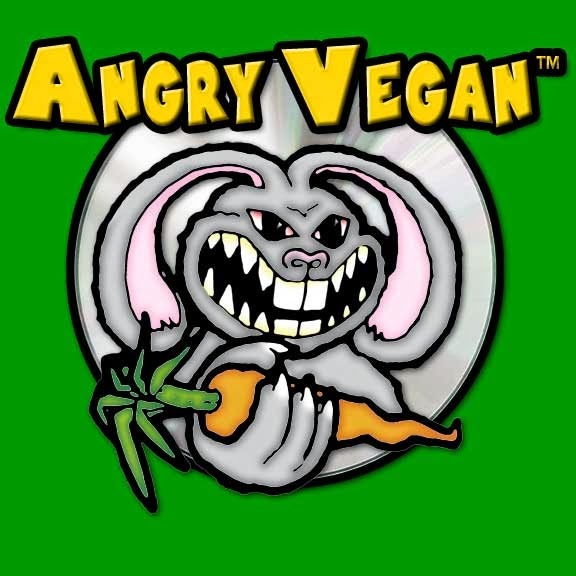 Anyone?”) And yet for the three decades I've been an advocate, there has always been a segment of vegans who have built vast and elaborate rationalizations for basing their “activism” on screaming and hatred (and attacking anyone who is not sufficiently pure and dogmatic). 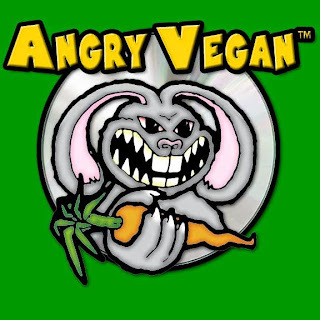 If we are honest, it is clear that the “vegan” brand is damaged beyond repair. And yet many of us insist on pushing the vegan message (and only pushing the vegan message) knowing full well that the vast majority of the populace will reject it without consideration. Even though most people oppose factory farms, and would be willing to take some step to cut back their support of factory farms, many vegans refuse to take the opportunities we have to offer up a constructive, achievable, and sustainable ask. 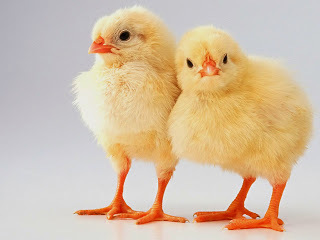 For example, when we're making a specific case about certain animals – e.g., that birds are brutalized horribly on today's factory farms, and in numbers far beyond any other species – many of us just can't help but end with a “Go VEGAN!” message, nullifying any chance we had of making a real connection and difference. 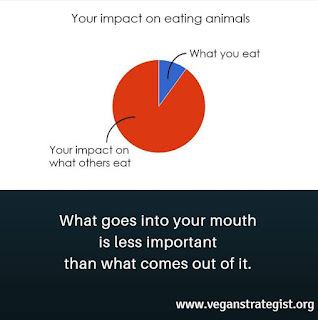 Furthermore, even when we don't use the word "vegan" explicitly, we use arguments that, when heard in the real world, leads to many more animals suffering. 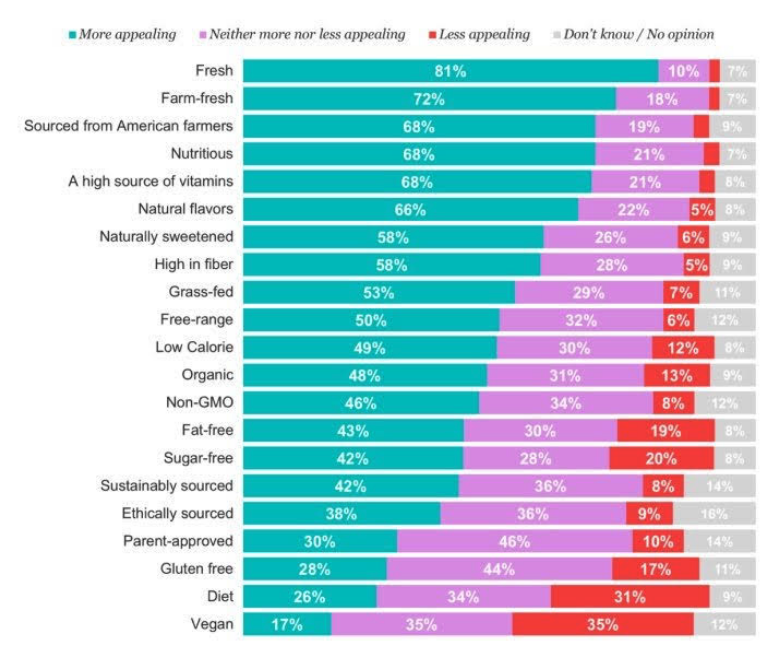 When we argue health, what people hear is that chicken is much, much healthier than red meat. When we argue the environment, people note that beef is orders of magnitude worse than chicken. Even arguing compassion has pitfalls, as people generally identify much more with mammals. Although these arguments can seem effective within our community, in the bigger picture, they lead to a lot more animals suffering. The push to replace red meat with chicken – supported by all our arguments – has driven the huge increase in the number of animals factory farmed every year. However, promoting a poisoned brand and using counter-productive arguments are not even the half of it. As has been found by a number of surveys, the vast majority of people who go vegetarian eventually go back to eating animals. 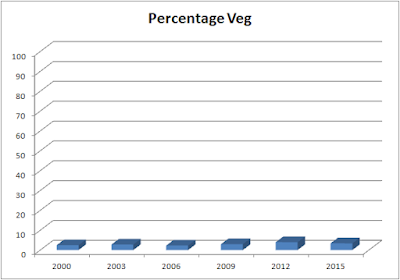 More than four out of every five individuals who go veg eventually quit! It would be bad enough to realize that we’re throwing away more than 80% of advocacy efforts. But it is actually worse than that. Everyone who quits being veg becomes an anti-spokesperson against making compassionate choices – a public (and often loud) example opposing taking any steps that help animals. And why does nearly everyone who goes vegetarian go back to eating animals? One main reason is that people don't feel healthy. Again, this has been a failing of many of us in the vegan advocacy community. We vigorously insist that all animal products are deadly poison, and promise that eating vegan will cure all our ills. We fail to give people a complete understanding of nutrition, and we also fail to provide them with a reasonable guide to what they can eat that they'll find familiar and satisfying, as well as easy to shop for and prepare. 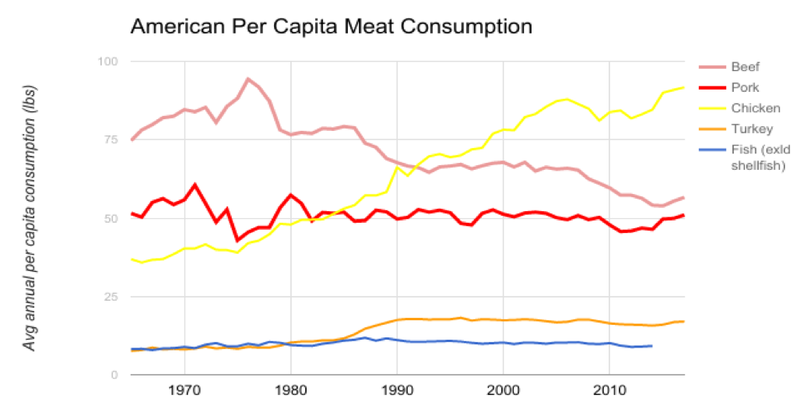 So it isn't surprising that so many people revert to eating meat. But we go out of our way to make it even worse. Now of course, this doesn't matter if all we care about is the exclusivity of our little club. 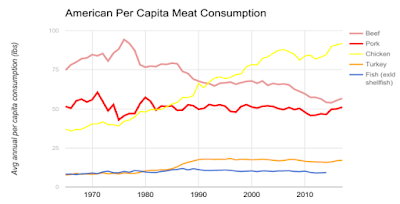 And we've done a good job of that, given that the percentage of vegetarians has basically not changed in decades, with all the fluctuations within the margin of error. But if we care even the tiniest amount about the suffering of farm animals, then we simply must admit that the outreach we vegans have done has been an absolute and utter failure. The facts are stark, and they are brutal. This year in the US, more animals will suffer horrific cruelty on factory farms than ever before. 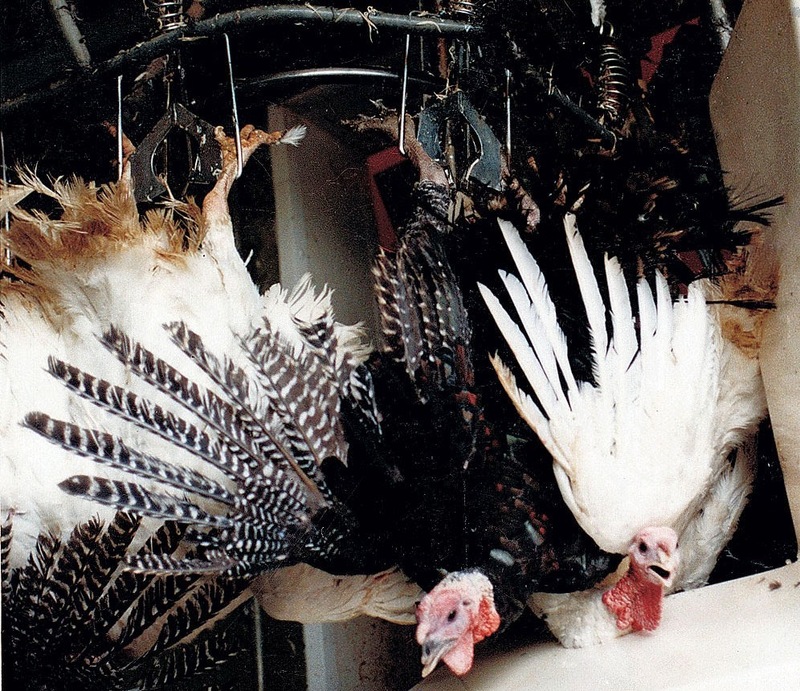 This year, the average American will eat more factory farmed animals than ever before. 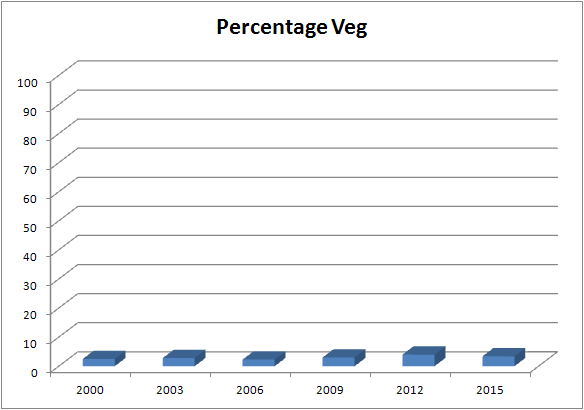 And for all the reasons outlined above, we vegans are culpable. We (and I include myself here) have poisoned the message of compassion, insisted on pushing a message we know people will automatically reject, and have undermined and driven away millions of individuals who have tried to join us. 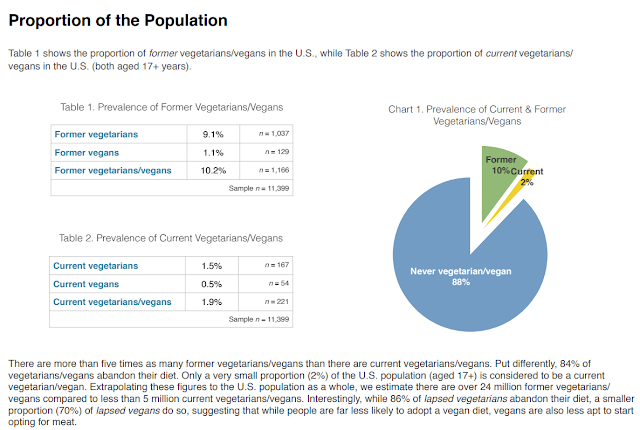 As Paul Shapiro and I have said for at least 15 years now: The greatest impediment to the spread of veganism is vegans. Luckily, I believe there is a better way. I hope you will click and consider it. Another good article! It will be shared on Facebook.com/ChicagoVeg tonight. Hey Matt Ball, I came here from a video you just put out with Vox advocating having people cut out chicken from their diet in favor of beef in order to reduce animal suffering. I felt that there was a massive oversight in that video, namely that it ignored the immense amount of green house gasses that were produced in farm production of cows as opposed to chickens. I don't know the exact numbers but I'm suspecting the net result of the green house gasses emitted by cow farming produces more net animal suffering than does chicken farming, not to mention quite a bit more human suffering as well. Also, you may not agree with me on this, but I don't value animals on a life to life basis, I hold more value to animals that are in danger of going extinct, and animals that have greater intelligence both social and logistical. 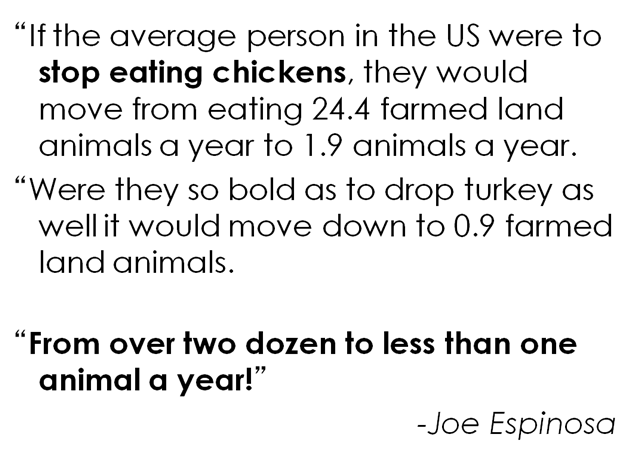 If your goal is to reduce animal suffering as much as possible, encouraging the consumption of cows over chickens seems immensely counterproductive to me, and I bring this up because I am concerned about the environment as a whole, including animals. 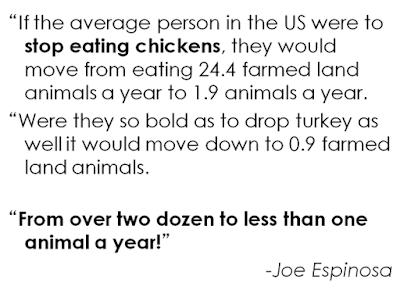 It surprises me that here you do actually cite statistics that show how much more harmful cows are to the environment than chickens, but then choose to ignore those environmental factors in making your moral decisions about meat. I believe that you genuinely care about this issue, but due to this oversight I cannot but believe that your thesis is in direct opposition to your mission. I don't believe it is at all responsible to ignore environmental factors when deciding on a moral diet, in fact I believe that is the opposite of responsible. 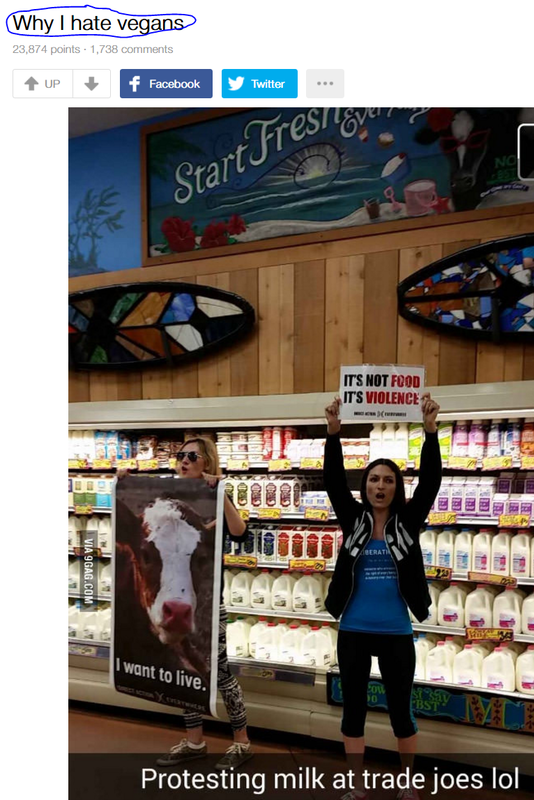 I believe that spreading the message that eating cows is more morally righteous than eating chickens is genuinely morally wrong, or at least morally ignorant. I won't pretend to be a more righteous person than you, I eat meat after all, I try to avoid beef in favor of chicken, and when I buy chicken I have a preference for organic chickens or otherwise chickens that are treated better than your average chicken. While I am myself not a vegan I do respect those who have made that decision as being of strong moral character, at least for this specific form of morality. 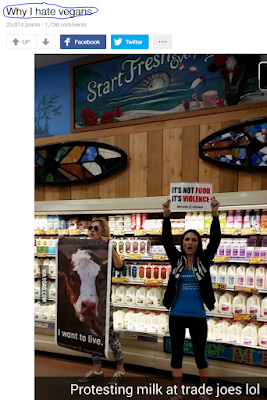 I'm just concerned that your message might ultimately cause more harm to the environment as a whole, than encouraging people against beef in favor of chicken would. Eating a burger or steak will be responsible for a tiny tiny amount of additional methane in the atmosphere. This will have exactly zero impact in the world in terms of actual suffering (I say this as a former DOE Global Change Fellow). Eating a part of a chicken is directly responsible for multiple days of actual torture of a sentient being. Sorry I didn't spell that out directly. Matt, the recent video on Vox where you encourage people to eat beef is incredibly irresponsible and completely incorrect. 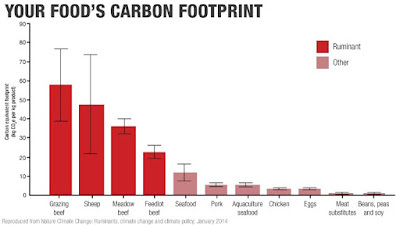 To encourage people to eat beef instead of chicken will invariably lead to global warming at an even faster scale. This will result in much more human suffering, but it will also increase animal suffering at a completely different magnitude! When climates change and lands dry up, at least people can leave to greener pastures, or there is international help. Who helps the animals? No one, if they do not adapt then they suffer and die. And by your comments "Eating a burger or steak will be responsible for a tiny amount of additional methane in the atmosphere" You show that you do not have any understanding of statistics and the power of numbers. Yes, you as an individual do not make a big difference but lots of people together make a massive difference. What if we turned around the argument back to you that if I eat one chicken the actual amount of suffering that it adds is minuscule and therefore its no use to do it. Jun, it would be great if you would actually address something -- anything -- I *actually said* in the video. As for what you say in your latest comment - how does eating beef *actually hurt* other animals (it obviously hurts the cow)? As the environment changes, wild animals will continue to suffer and die, *just as they do now*. There may be fewer of them, or there may be more. All wild animals suffer, and all wild animals die, regardless of global warming. But at least they aren't being tortured. I know it is hard to get past environmental orthodoxy. But we should simply not worry about some alleged abstraction and look past actual torture. I'm sorry I am failing to convey this to you, and that you misunderstand what I actually say in the video at Vox. The bottom line is that if you are eating chicken, you are paying someone directly to torture a sentient being. The rest is all hand-waving. Note: my personal blog is not a forum for general debate. Good luck to you!